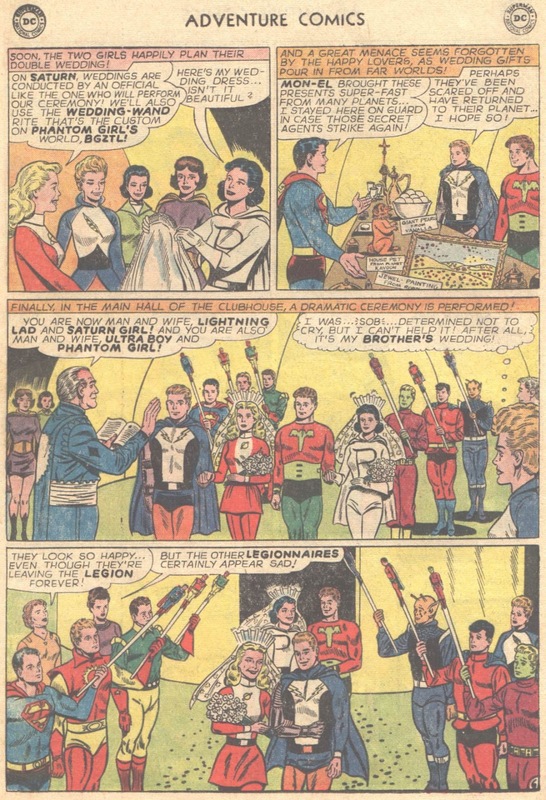 Hello everyone and welcome to another chapter from the history of the Legion of Super-Heroes. When we last left off the Legion faced Starfinger who turned out to be a mind controlled Lighting Lad. 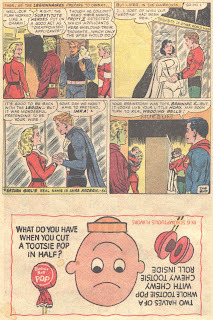 As such we move to October of 1965 and Adventure Comics 337. 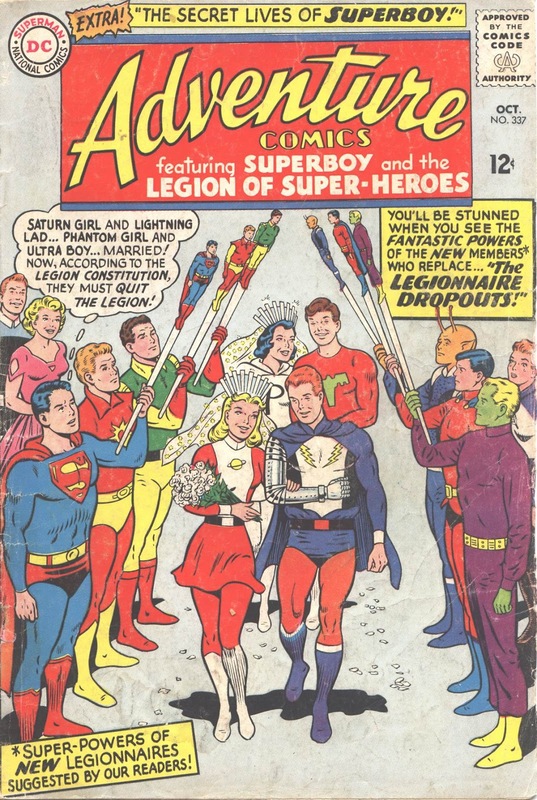 The cover given the period when this was published shows the Marriage of Lighting Lad and Saturn Girl and Phantom Girl and Ultra Boy. The Comic itself begins with Brainiac 5 talking of a impending crisis and that Ultra Boy and Phantom Girl are holding hands and not listening to him. 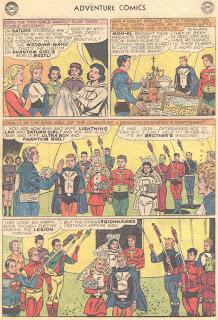 Brainiac starts to berate them only for Saturn Girl to step in and for him to comment that she is doing the same thing with lighting Lad. 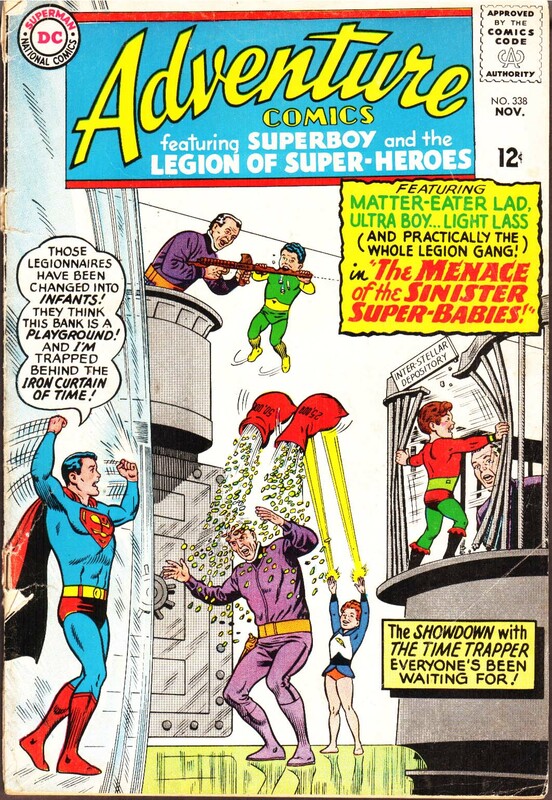 However, Brainiac and Superboy talk about Plan R and using Legionnaires to hunt for spies. Later the loving Legionnaries head to the clubhouse museum and talk about different marriage customs. The two groups on different sides of a exhibit start kissing and soon are caught by Brainiac 5 and Superboy. Also at this time secret agents are listening and preparing to bring down the Legion. 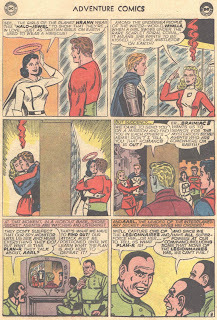 Soon the Legion starts searching for these agents all over the place and suddenly they appear and attack Saturn Girl. Luckily she is saved by Lighting Lad. After this Lighting Lad and Saturn Girl along with Phantom Girl and Ultra Boy decide to marry. This deeply shocks Brainiac 5 and we have a moment where we see he is not as cold and computer life as he seems. 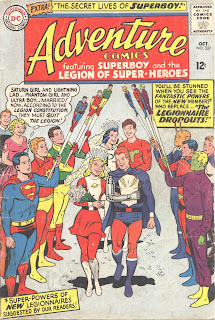 Soon the wedding happens and due to a clause in the Legion constitution they are forced to retire. The spies see all this and plan to infiltrate and destroy from within. Soon after the Legion hold their open try outs. Members of the Legion of Substitute Heroes try out but are once again not accepted. However, the three spies also try out and get accepted as replacement members. The new members wish to help out and go off searching for themselves and lay a trap which takes out Cosmic Boy and Element Lad. They than ransack the clubhouse looking for Plan-R to destroy it. It turns out that Plan-R is a ploy by the Legion to find out who wants to invade Earth. Then in flashbacks we see that the weddings are fake and a ploy to lure the spies into a false sense of security. Soon on the planet the spies come from the Legion Land and reveal Plan-R is nothing but rubbish. 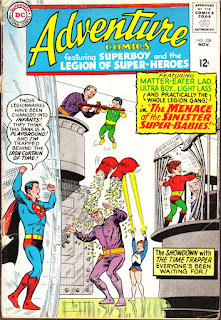 The Legion then destroy the super-computer helping the spies out on their home planet. Once everything has returned to normal we see as the comic ends that the four who wed have feelings for each other after all and kiss again. Well its once again time to post another Dartboard Cinema episode. This time we explore the last Movie in Lynch Month by taking a look at a very interesting Mulholland Drive. Hope everyone enjoys it. Hello Everyone, Here is the next epsiode of Dartboard Cinema. This time we take a look at David Lynch's Lost Highway. A very interesting movie that at times is very hard to define.